Bleary-eyed from the long road trip and slightly spinning out from the altitude, I had a little time to wander the streets of Cusco on the Sunday of my arrival before the start of the weavers’conference on October 1. The trip from my home to my hostel had involved fourteen changes of transport including an overnight bus ride, the highlight of which was watching the big ol’ yellow harvest moon rising over Lake Titicaca. Stunning! I don’t think I have ever seen such an intensely bright moon before. 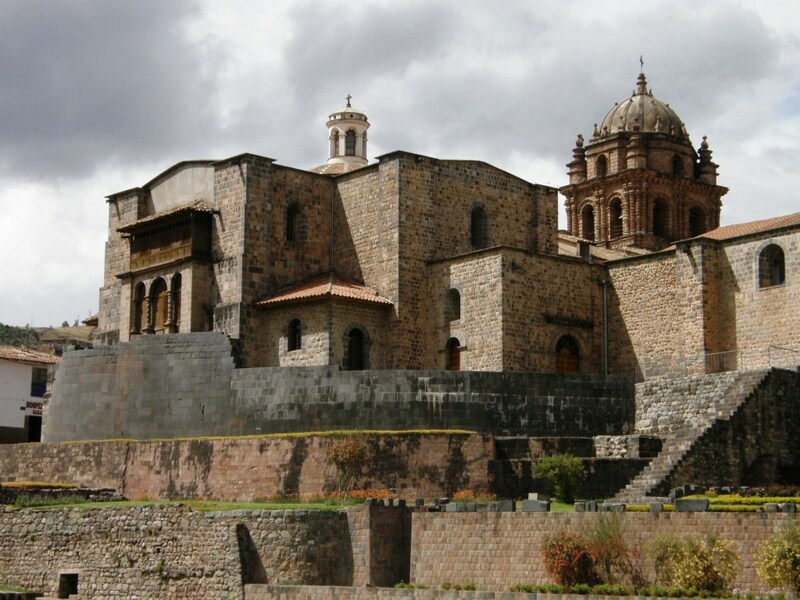 This is the church of Santo Domingo built by the Spanish colonists on top of the stonework foundations of the demolished Inca temple Qorikancha. 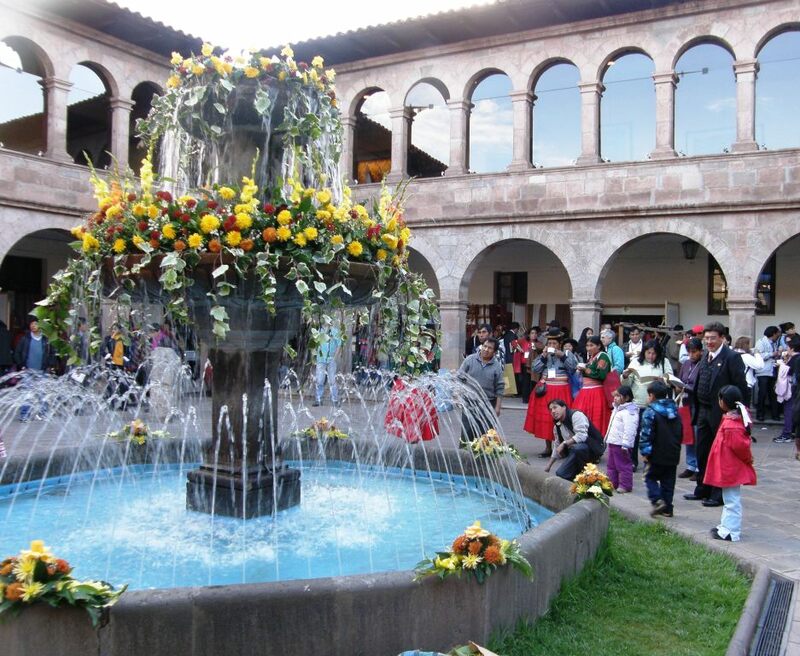 The inca stonework has apparently survived earthquakes which the Spanish construction was not able to withstand. The CTTC is one of those strange and wonderful black holes where you lose all sense of time! I sat with the weavers all afternoon and learned so much. 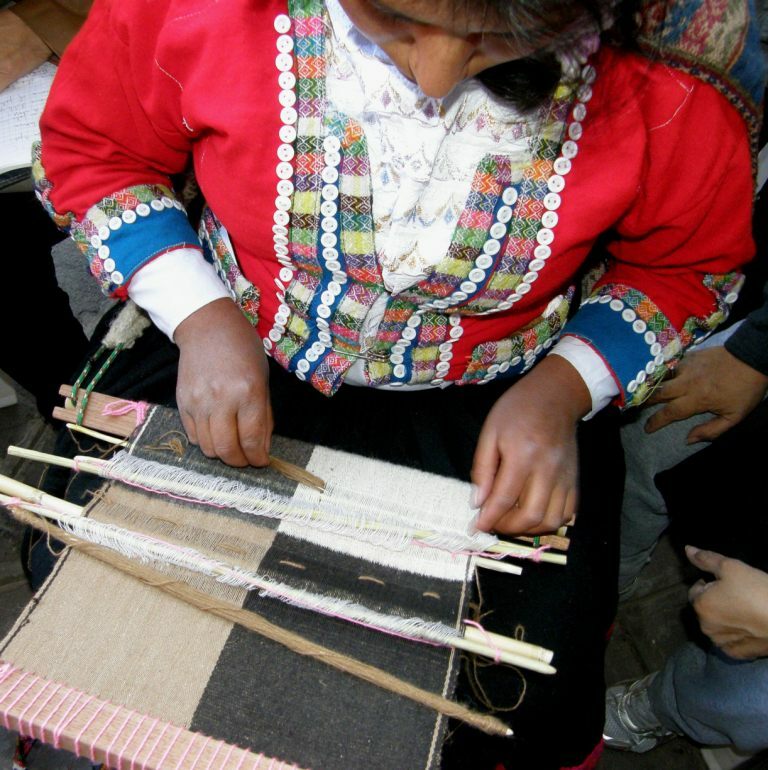 A weaver from Chahuaytire let me sit by and watch while she wove and sewed a tubular band to the edge of a finished weaving. 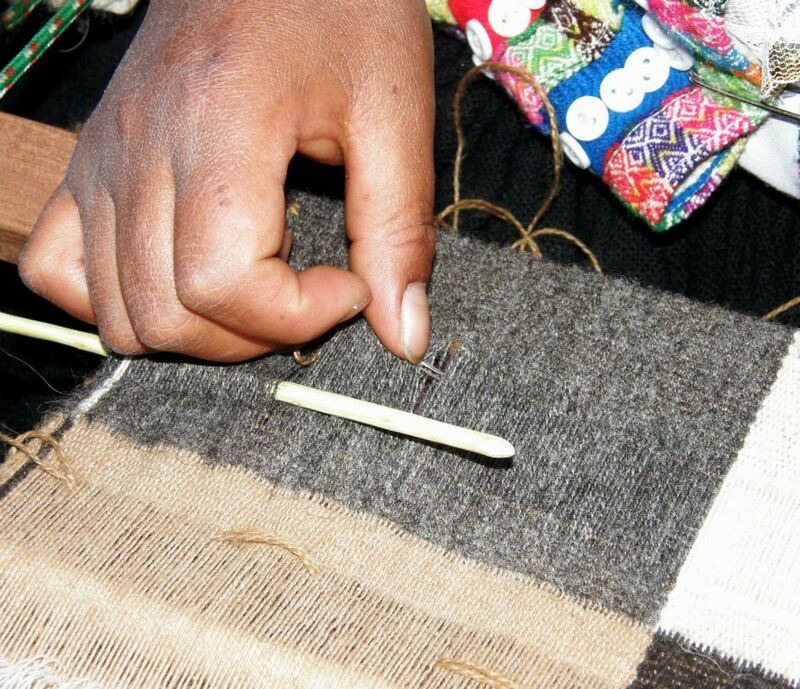 You can see how a thread toward the end of the cloth extends to her toe which helps the weaver hold the cloth taut as she sews. 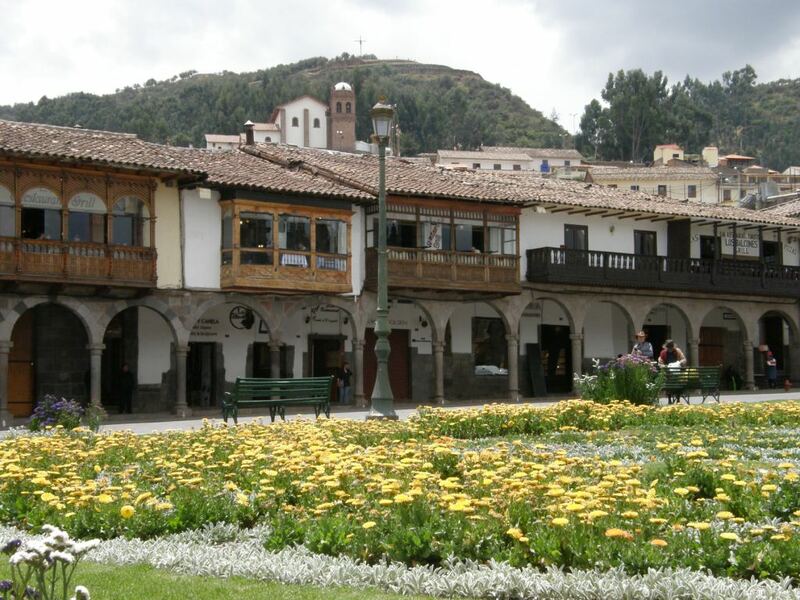 Eventually, fatigue started to set in and I spent a little while in the evening trying not to nod off in the pleasant flower-laden main square of Cusco before admitting defeat and crawling into bed. I had no trouble sleeping in my cheapo “party hostel” in a room with seven strangers! But back to the present for a moment….I had fully expected to slip back into the old routine when I got back home late last Sunday. I thought that I would have no problem spending a couple of days going through and editing my pictures from The Encuentro de Tejedores de las Americas and that I would get my blog post out on Thursday night as usual. You would think that I would be bouncing around with energy with all those rich red blood cells that I must have grown during my week up at high altitude. Unfortunately it doesn’t work that way! I was tired after the week of intense activity and the long road trip back and very much wilted by the Santa Cruz heat. This is one my favorite souvenirs of the trip… the piece on which I worked on the last day of the conference which was Workshop Day. 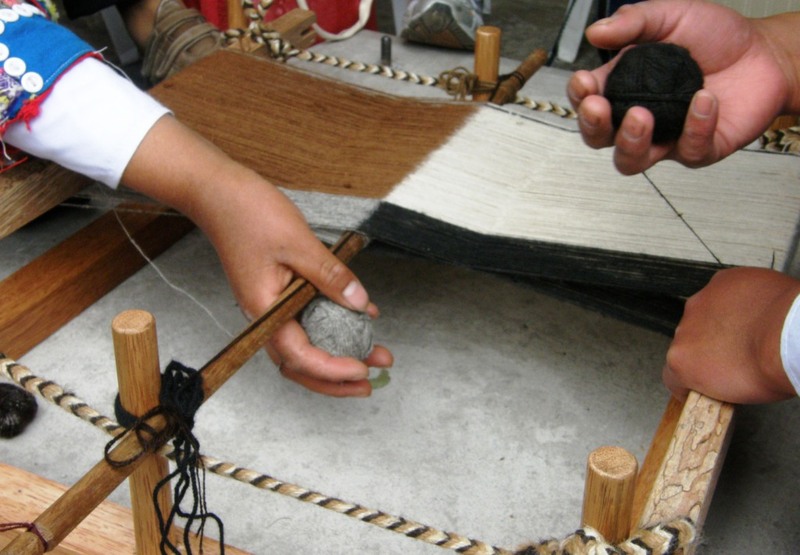 The weaving technique is called ticlla, or, discontinuous warp, and it allows changes of color along the length of the warp. As you can see above, the piece is divided into panels of color along its length. The white panel changes to black and the grey to brown. 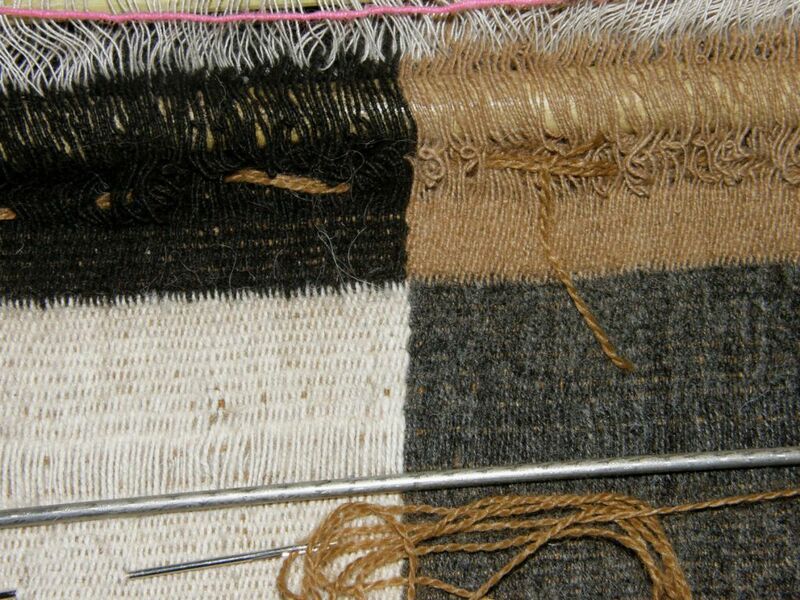 Both halves of the piece, that is, the grey and white and the black and brown, will be woven with four selvedges. It was very exciting arriving on Friday morning and seeing these sitting on the table…..and yes, I was the first one to get there! 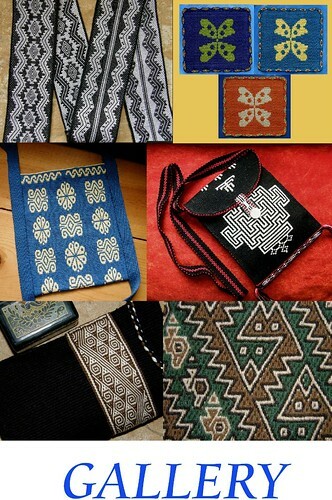 And there were our teachers from Pitumarca sitting in conference, possibly reviewing some teaching strategies, each wearing a stunning lliclla decorated with pick-up patterns on panels of discontinuous warps. If you think that they look very young, you are right! Our two instructors, Janet and Petra are twenty-two and eighteen years old. 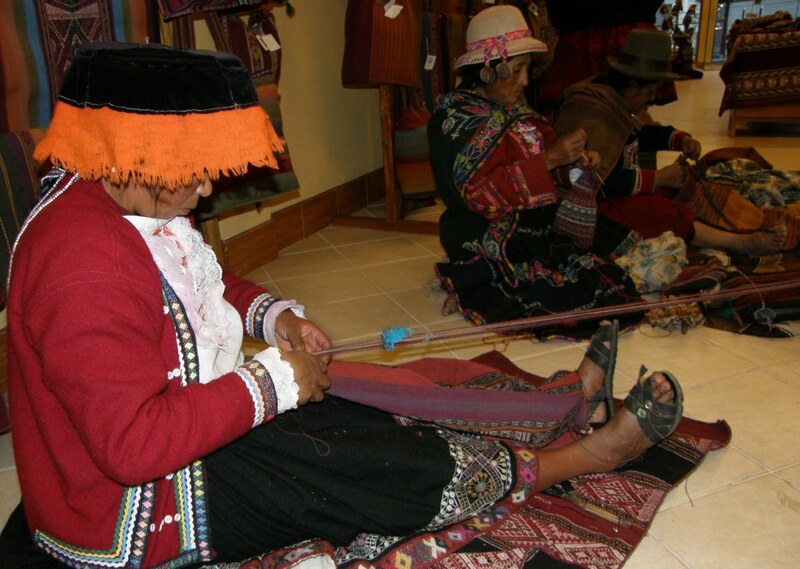 Janet has been weaving for fourteen years and started weaving ticlla when she was twelve. We were split into groups and Janet and Petra showed my group the warping process. 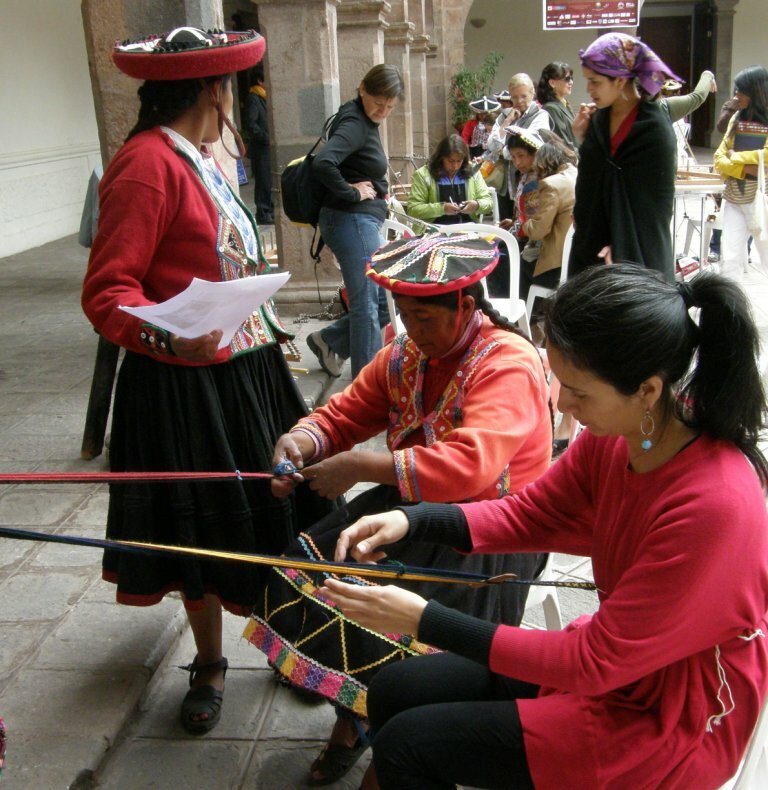 This process of warping is something that I had only ever seen in pictures some of which, like the one below, had been taken and sent to me by my friend DY when she visited Pitumarca in 2010. The pictures were enough for me to be able to make some small experiments of my own with this technique at home but there is, of course, nothing like seeing the whole thing unfold before your eyes. How much nicer and simpler it is when there are two pairs of hands at work! I warped three panels on my own at home and had to call several toes into use to hold tension on warps of one color while my two hands worked with warps in another color. 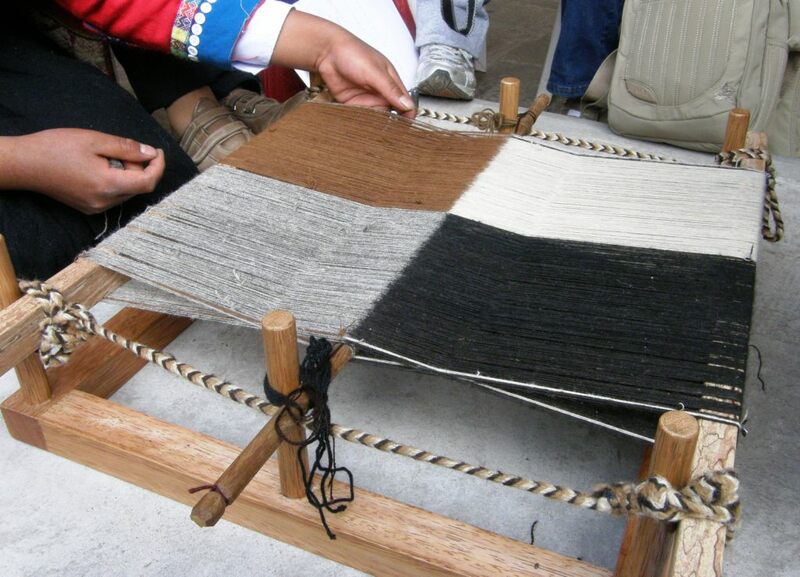 Janet, the more talkative of our two instructors, explained that the natural alpaca colors that we were using are called yoro (white), ch’umpi (brown), o’que (grey) and yana (black) in Quechua. How deftly the two ladies passed the balls of yarn back and forth falling naturally into a rhythm which they were able to maintain even as we plied them with questions. Black and grey warp threads are being wound simultaneously with each color following its own figure-eight path. They are passed in turn around a central rod in dovetail fashion. This allows the creation of panels of different colors. Each half of the piece will have its own shed rod and set of heddles and will be woven with four selvedges. 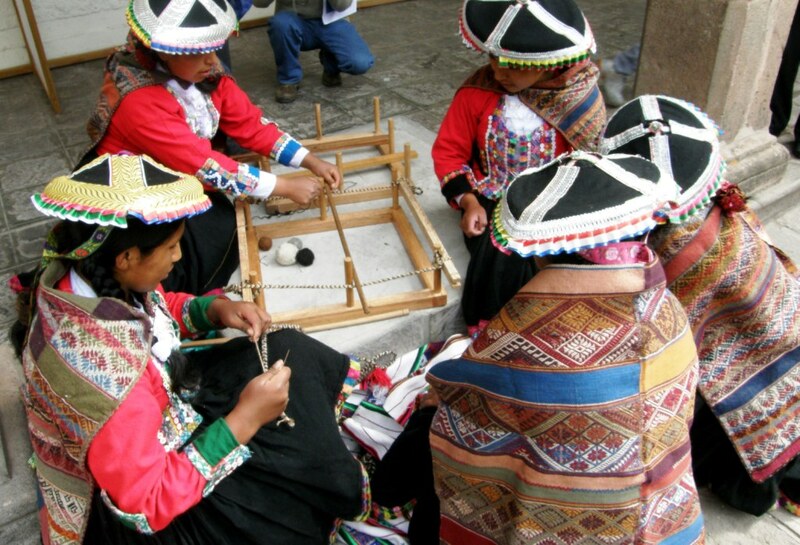 While we watched the creation of this warp, other ladies from Pitumarca were busy setting up the prepared warps on which each of us would weave. We stood up from the demonstration to find twelve warps stretched out and ready to go. The pretty courtyard of the convention center was conveniently surrounded by pillars to which we could attach our looms. And now you will find that there is a sudden lack of photographs on my part…I was far too absorbed in my weaving to stop and take pictures! 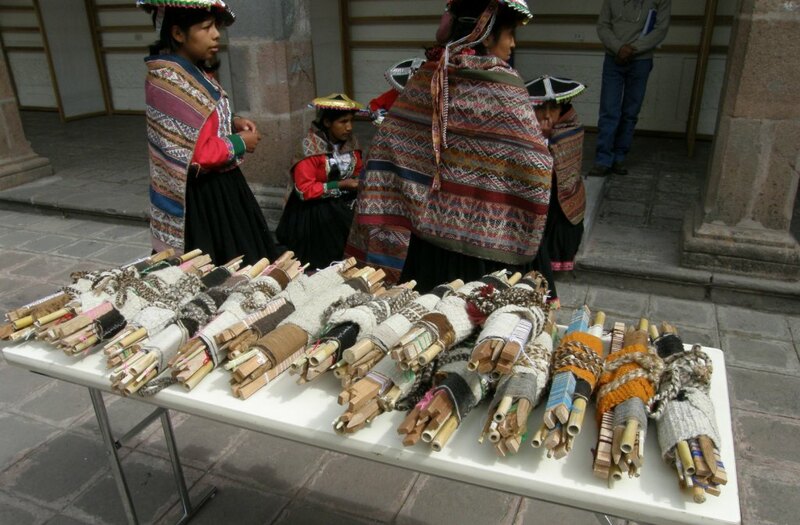 Here’s one I took on a short break…nearby, weavers from Chinchero were giving a workshop on making jakimas with pick-up patterns. Above you can see a couple of jakima students with their instructor. Beyond them you can see my “pillar partner”, Marcela with the head scarf and cloak of her Mapuche people in Chile. There is something special about sitting all day and weaving next to someone who shares your passion. The preceding four days of conference had been hectic…so much to see and do. This last day allowed us all to slow down and take some time to talk and get to know each other while working at our looms. Janet had to come and pry us out of our chairs to take a lunch break. The discontinuous warp piece had been started with a few rows of weaving at each loom bar as well as at the center cord that held the dovetailed warps. Therefore, the four selvedges on each half of the piece had been set. 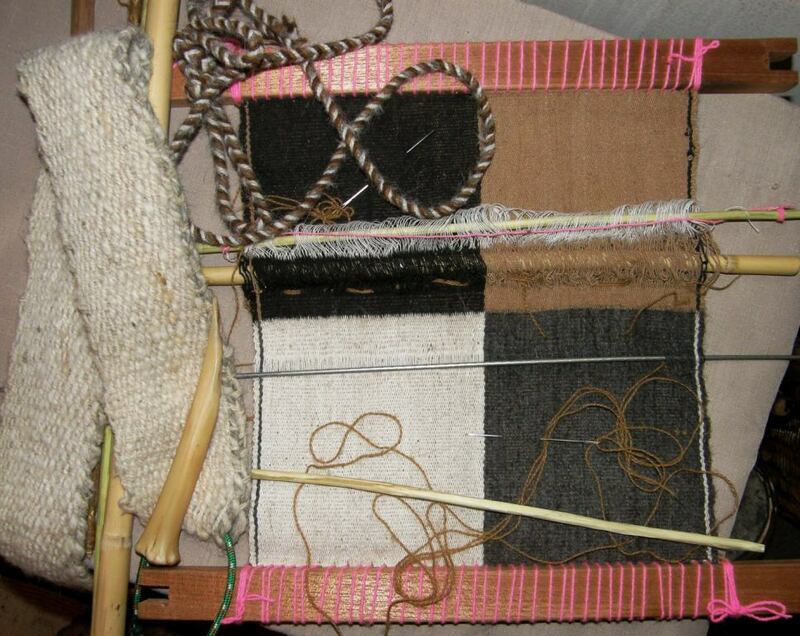 Our task, therefore, was to weave to fill in the gap between the loom bar and the center. As the gap got smaller and smaller, naturally it became increasingly difficult to open the sheds and pass the weft. The later part of the afternoon session of the workshop was spent watching a demonstration of how to go about creating sheds and passing the weft as the space in which to work decreased. I have to tell you that there are no secrets or magic solutions to this…it’s simply a matter of plain old determination, tenacity and patience. When the shed rod is too big for the small space in which you are working, replace it with a thinner one. When the shuttle is too thick for the shed you are creating, pass the weft on a needle. When it is impossible to open the shed by pulling on the heddle rod, remove the heddles and rod and create the shed thread by thread with the blunt end of the needle. Save the shed on a stick and then pass two wefts…one on the each side of the gap. Plod along like this and you will slowly but surely get there! By the way, I was not happy at first about having to use brown weft to weave the grey and white panels as the brown could be seen slightly between the white warps. However, once I got to the needle-weaving stage I was very grateful to have that contrasting color weft as it clearly showed me under which warps I needed to pass the needle. It is much harder to see the warps for needle-picking in the grey section than in the white. I am guessing that doing the other half (the black and brown one) is going to be REALLY tough as the black will be hard to see and I won’t have the benefit of contrasting color weft in the brown section…oh boy. Here I was at home on Monday inching my way to closing the gap. The metal rod is a long Navajo weaving tool that I have that came in very handy with its flattened shovel-like nose. It held the shed open while I passed the two wefts on the needles.When that rod became too thick for the shed, I changed to an umbrella rib. It was all guess work and experiments at this stage as Janet did not get to this point in our class. We ran out of time. 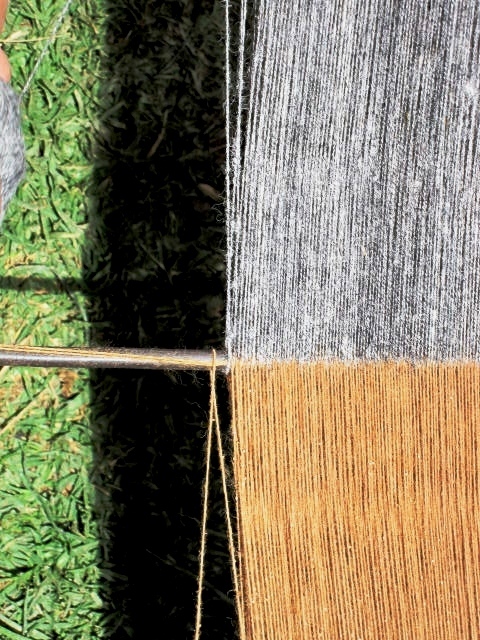 The final weft went in alone on a needle…over, under, over, under. It’s funny that I had expected the finish area to be noticeable because the wefts would not be as tightly packed as they are in the rest of the piece. As it turns out, it is exactly the opposite! I packed in too many wefts in the gap and that part is more tightly woven than the rest! Do I dare undo all that hard work and remove two wefts? I don’t think so!! Now to attack the other side. I have high hopes of finishing this before I leave for the US next Wednesday. I want to attach a patterned tubular band around the piece. So that was the Workshop Day. What about the rest of the conference? Oh my gosh…I have SO much to show and tell but this is enough for this first installment…my loom is calling as well as prep for my US trip. I plan to write more before I leave about…. 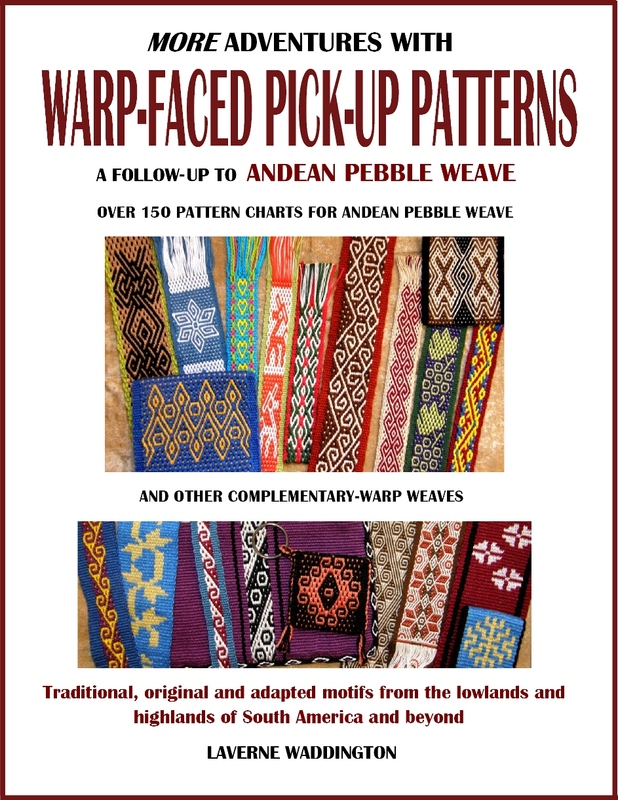 one meter-wide backstrap woven pieces, backstrap looms with 24 heddles, gorgeous ponchos made from handspun vicuña fiber, cotton ikat-patterned shawls with intricate knotted fringes, double weave on horizontal looms, Tinkipaya weavings, cotton weavers from the lowlands dyeing their yarn with strange and amazing substances, all kinds of ways to set up and operate backstrap looms and make string heddles, tapestries from Ayacucho, new books…. and lots of weavers, wonderful weavers interacting and learning from each other! I met some of my blog followers from Chile and Argentina…what fun! 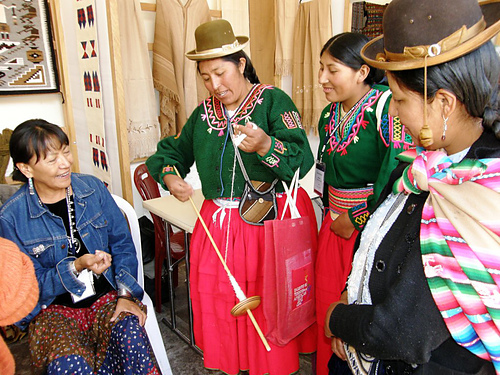 A couple of pictures to finish…I can’t resist!…a weaver and spinner from Puno, Peru shows Navajo weaver and spinner DY Begay how to spin yarn “Puno style” using DY’s Navajo spindle. This created a lot of laughter and fun…hand movements and sound effects overcame all language barriers. 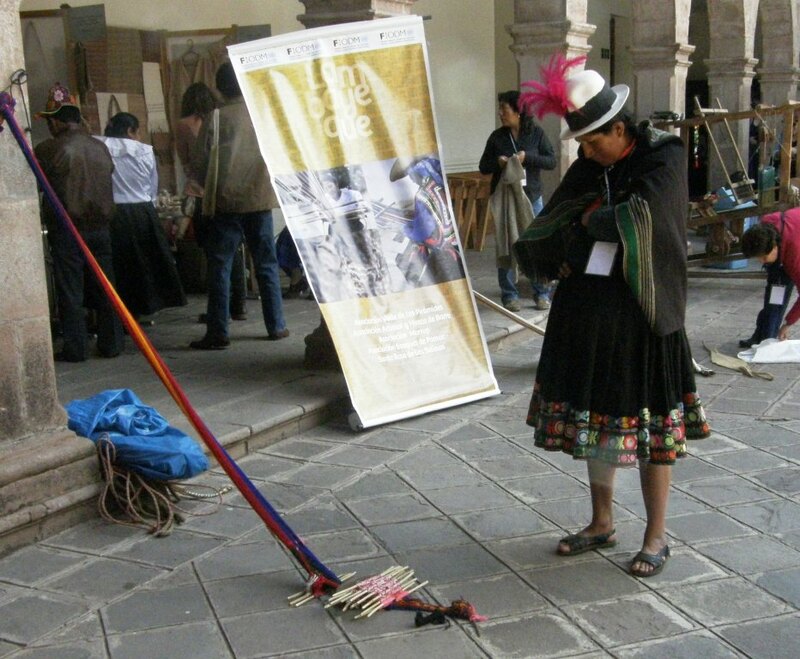 After another long day, a weaver from Tinkipaya, Bolivia who uses a leaning vertical loom, contemplates the backstrap loom with its twenty-four string heddles used to weave the traditional belt of San Ignacio de Loyola, Peru. More about that next time! I wonder what she was thinking. 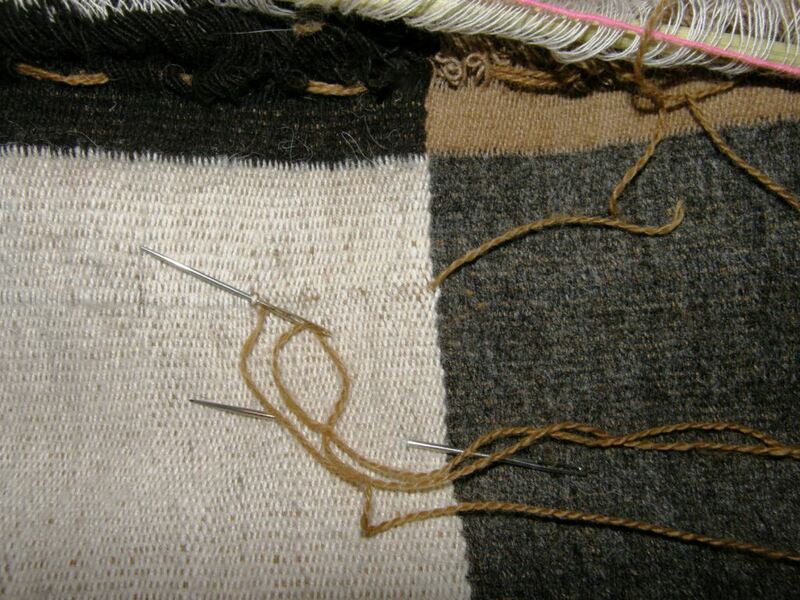 Took scaffolding / discontinuous warp workshop with Nilda 15 years ago at Martha’s place, still have those warps and llama bones, I could totally relate to your experience… that last few rows…sigh. 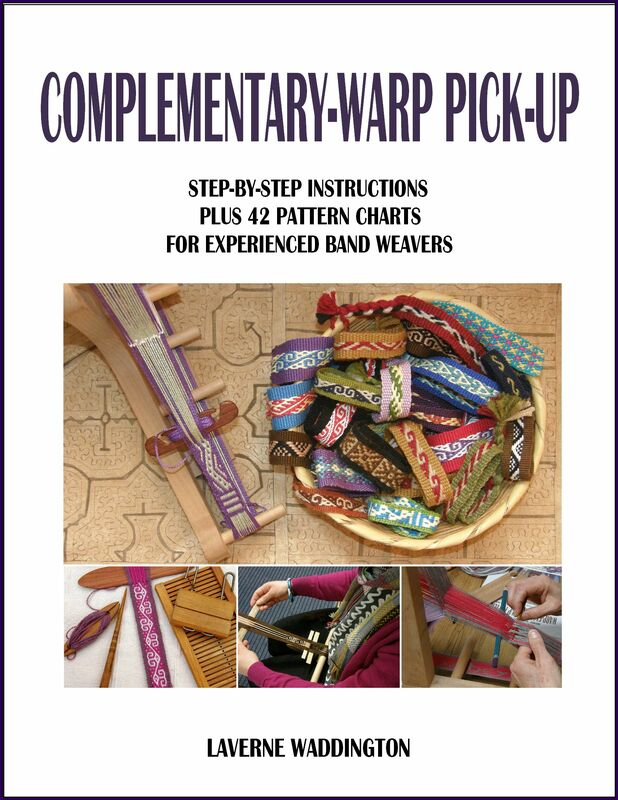 I got the discontinuous warp piece off the loom…BIG SIGH…but, call me crazy, I am looking forward to doing another! ¡Fantástico! Hermoso trabajo de preservación de técnicas andinas, de encuentro y compartir experiencias. Gracias por traernos algo de este maravilloso encuentro. So exciting to read of your recent experiences –thanks so much! Looking forward to the ‘rest of the story’ and those books you discovered! More story coming this week Pam. This will probably turn into a three-part saga with the books in part 3! Would love to have been there, but I am sure that, if you were on overload, I would have been prostrate. 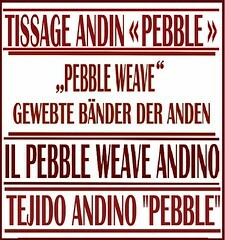 Your comment about the scaffold weave, “I was very grateful to have that contrasting color weft as it clearly showed me under which warps I needed to pass the needle” is what I wish I would have done with the double weave I recently completed. If I had used a slightly different color in the weft than I used in the edge warps, it would have been much easier for me to unweave the many times I made errors. It was difficult to find the weft at the edge on this two layer cloth. Next time I will do this. I will be awaiting your future posts on your Cusco adventure. You are right, Ann. Unweaving double weave is no fun at all. Using a contrast color weft could look nice at the edge too with a little spot of color. Time to come out of guilt ridden lurkdom. 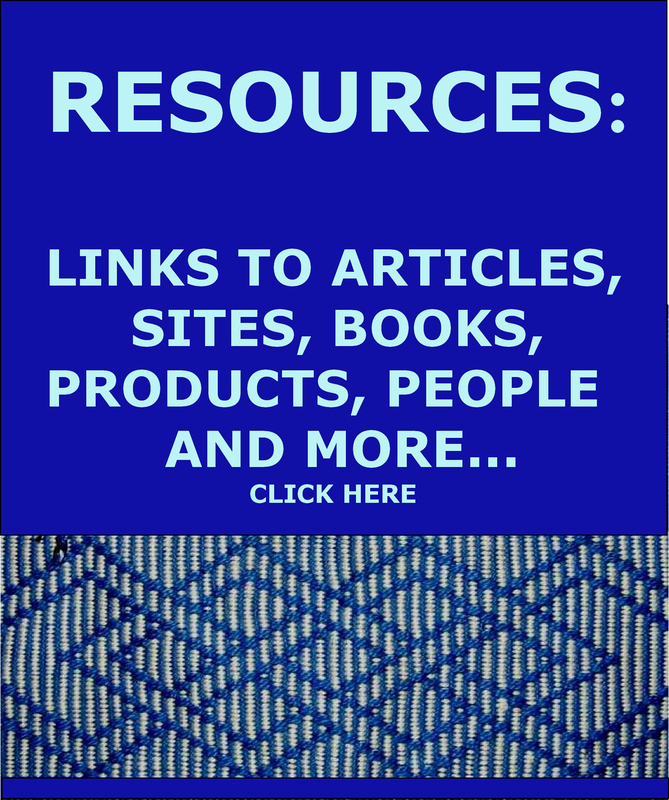 I have been reading and absorbing your blog for years….have your two e-books and you have been my idol for a LONG time. I live in western Massachusetts and have been a weaver, spinner, dyer for about 20 years. I have worked designing and making custom textiles for the interior design world, I have been dabbling in tablet weaving, some pick up and inkle weaving, and recently tapestry weaving BUT I have never woven on a backstrap loom and I can’t wait to get to it! I am amazed by your willingness to endure constant travel to learn. Looking forward to meeting and weaving with you Marsha. Thanks for dropping by. Thanks for dropping by. I always appreciate your comments. Another enticing post! Thank you for traveling and reporting back to us. I’ll bet I’m not the only one who starts looking for your blog whenever Thursday comes around. I’m not surprised when you are late a day or so, but we do notice! Thanks Janet. You will get a bonus… two posts this week!